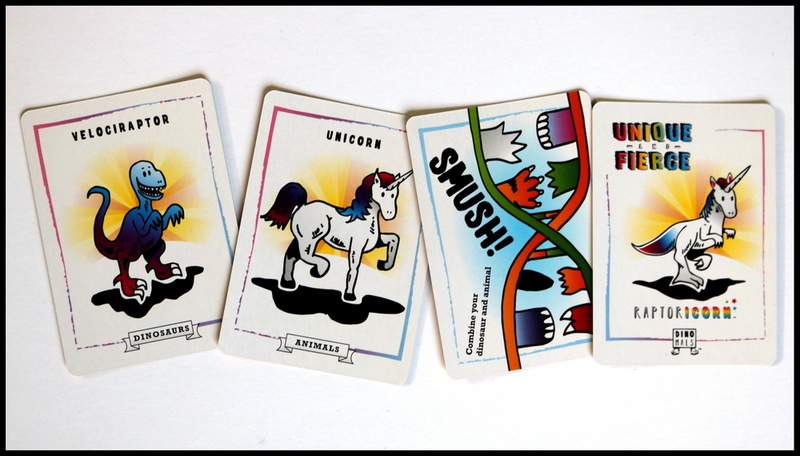 Dinomals: the action packed, mix and match, create-a-creature card game made by kids for kids! Your goal: make a Dinomal! Dinomals are half dinosaur and half modern day animal. Get the right dinosaur card and animal card and smush them together to make your Dinomal before your opponents. You can also mess with your opponents hand to stop them from building a Dinomal with SLAM cards! 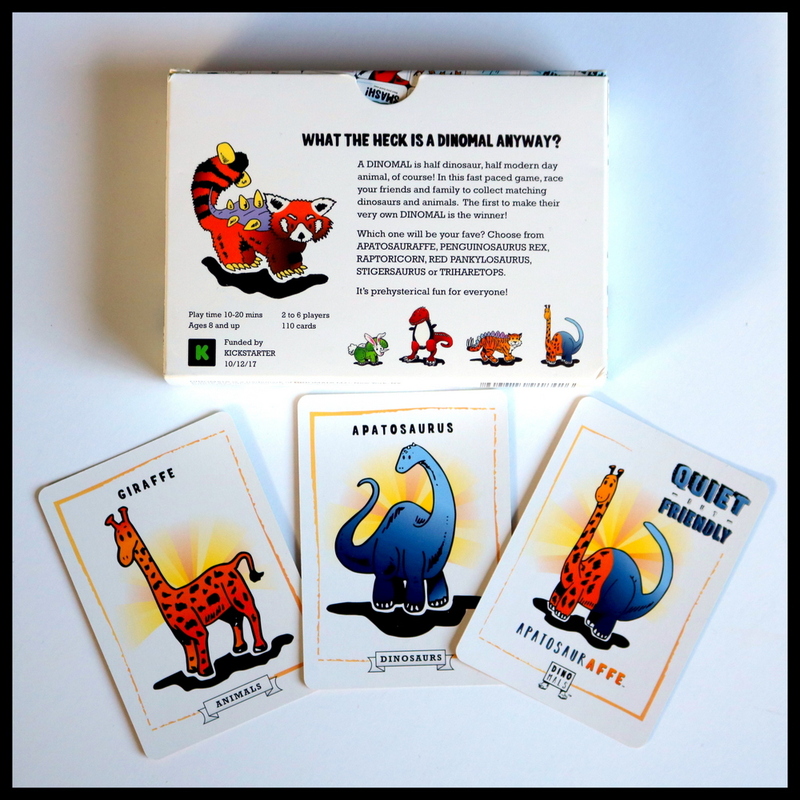 Dinomals is a family card game that was created by a family - a dad and his two kids. The goal is to collect the right set of cards to create a new Dinomal (half dinosaur, half animal). Along the way, you'll be playing lots of Slam cards to switch things up and get you closer to your goal. 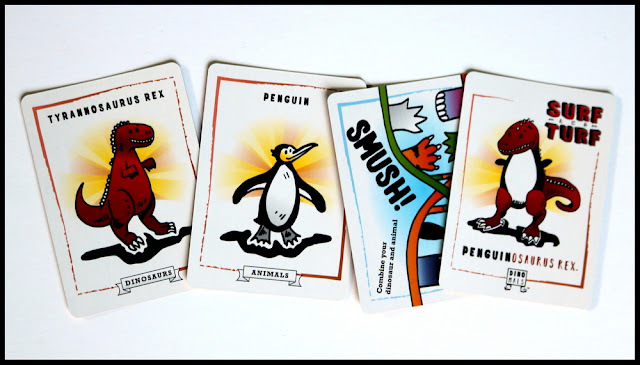 The theme is really unusual, quirky, and fun: mashing up dinosaurs with living animals to get new and interesting creatures. 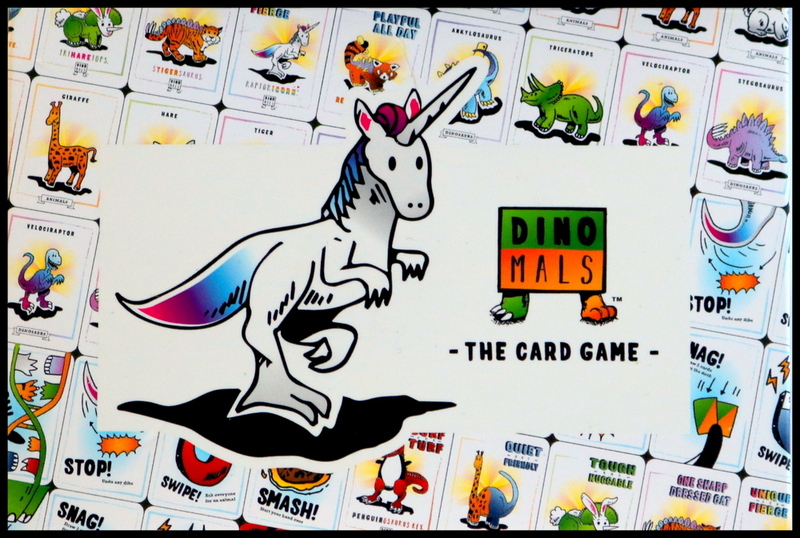 Dinomals is a card game, so it comes with a large deck of 110 glossy cards that need to be shuffled and dealt out, five to each player to start. 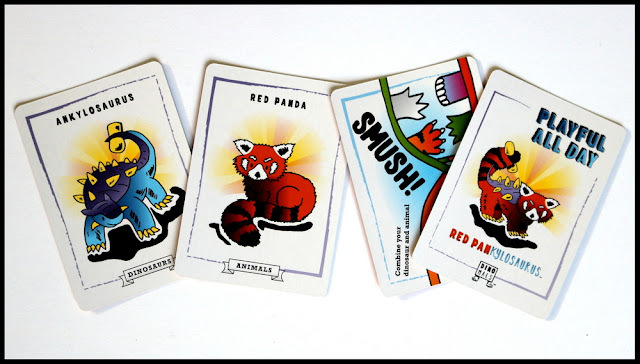 The bright, bold art is great, with engaging and amusing mashed-up animals as well as fun illustrations for the action cards. 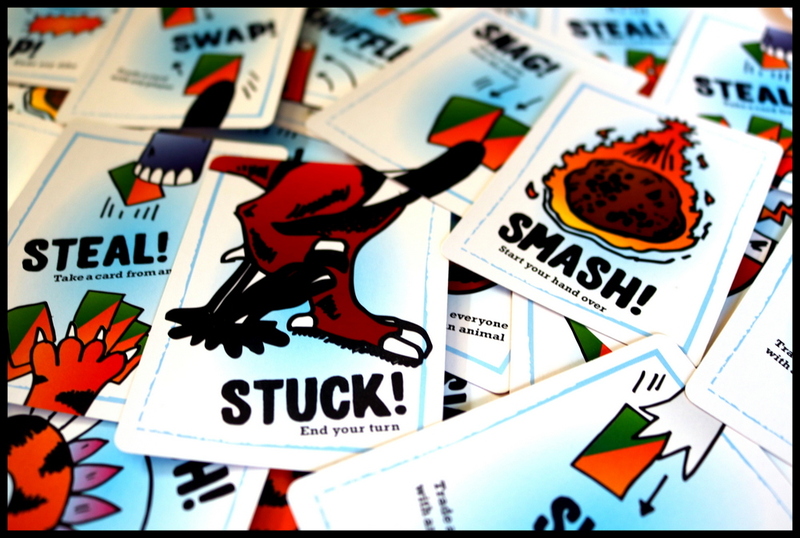 Disaster cards (Stuck and Smash). Dinomals is a simple family card game based on set collection with some additional actions. On your turn, you draw a card and then play as many Slam cards as you want. 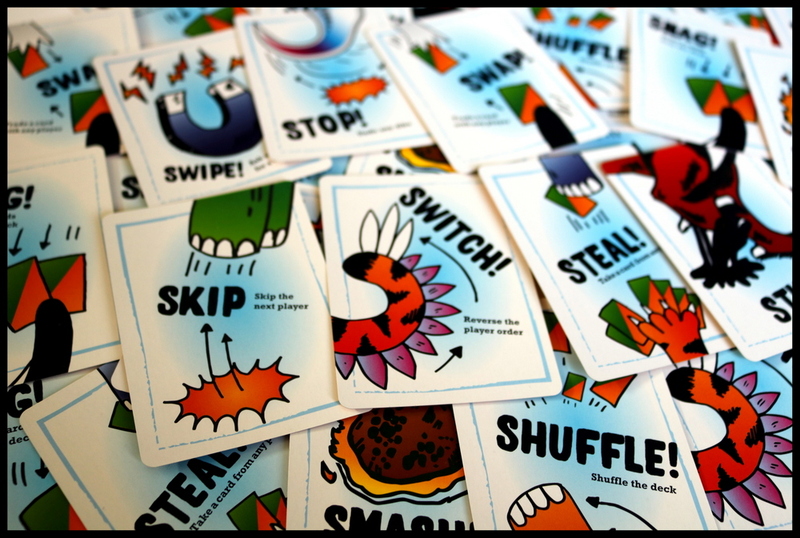 The Slam cards shake things up by letting you steal a card, swap cards, skip a player, swipe a particular kind of animal or dinosaur, snag more cards from the draw pile, etc. Be careful - if you draw a disaster card, you could be Stuck in the tar pits and lose a turn, or be Smashed by a comet and lose your entire hand! Along the way, you can choose to play a Dinomal to the table to call Dibs and be the only person able to build that type... unless someone plays a Stop card on you. The wide variety of Slam cards, paired with the ability to play as many as you want on a single turn, makes Dinomals high on interaction! 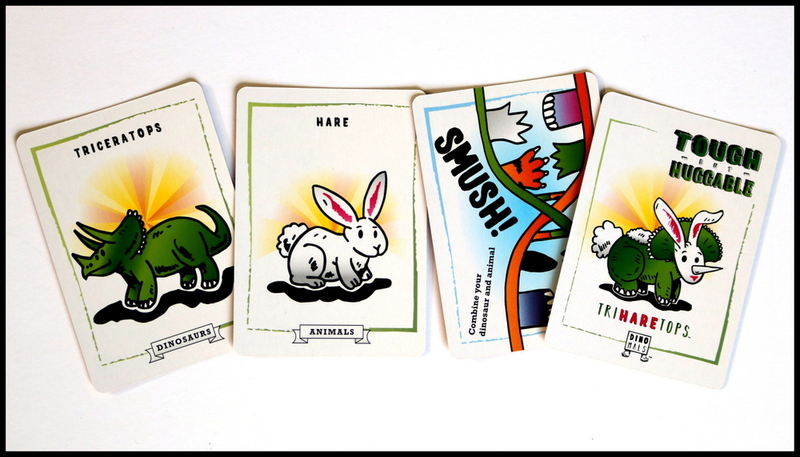 Once you have a matching set of Animal, Dinosaur, and Dinomal along with a Smush card, you play them down to the table to win the game. 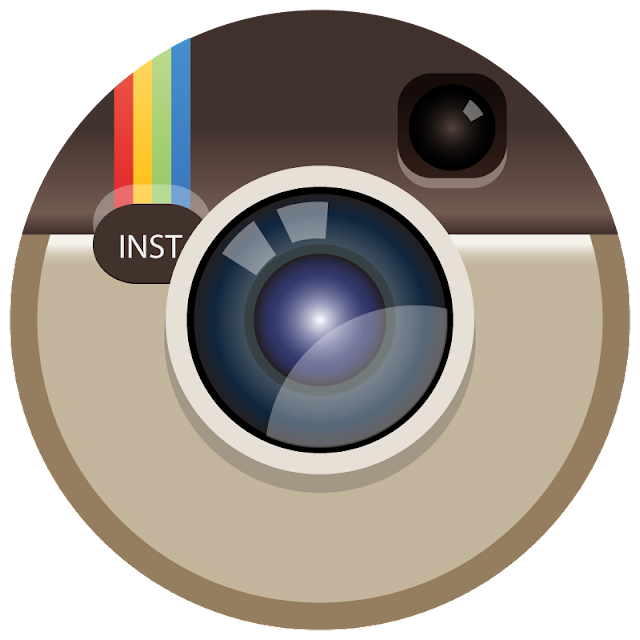 Games can also vary widely in length based on the number of players and luck of the draw. 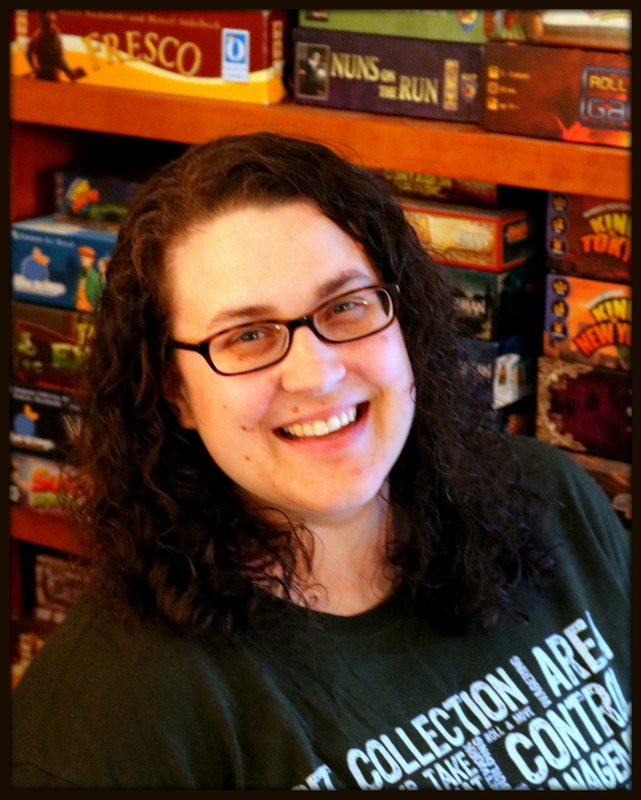 Our family had everything from a two-player game that only lasted about three minutes (I was lucky enough to make a complete Penguinosaurus Rex in about six turns) to a four-player game that took at least twenty minutes and a reshuffle of the towering discard pile into a new draw pile. 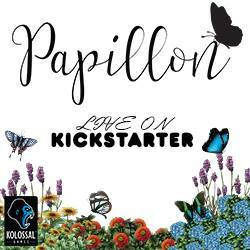 I love that this game was created by a family. 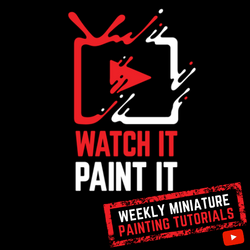 It has a level of silliness and an out-of-the-box creativity you only get from kids whose minds are still wide open to all kinds of amazing possibilities, while also having the polish of an experienced adult helping to run things behind the scenes. The art is great - eye-catching, cartoony mash-ups of some of our favorite animals and dinosaurs. 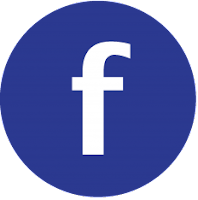 Play is at a great level for a family - interesting enough to hold everyone's attention but quick enough to play before bed, waiting for the train, or in other snippets of time during the day. MechDaddy commented that the deck seemed too full of Slam cards and that he felt he was digging just to find animals or dinosaurs. I thought the deck seemed fairly balanced, but I did feel it moved better at higher player counts. 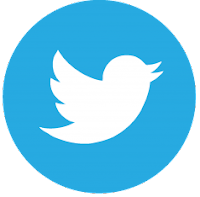 Perhaps we will come up with a certain number of cards to remove from the deck for a two-player game, to give a better sense of balance. Other than that, the only quibble I had is that we have a hard time with tuck boxes for card games (instead of lidded boxes). I know that cost and production certainly factor into those choices, and it's totally understandable, but I would hate for Dinomals to join the ranks of the ripped-and-ratty-box crew now stored in a plastic shoebox in the cabinet! 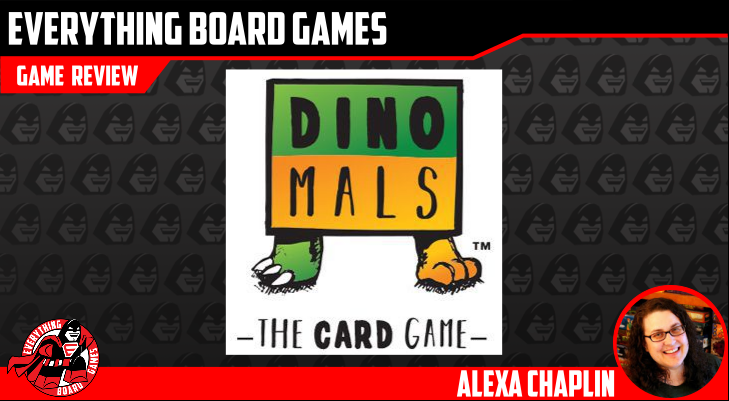 Dinosaur- or animal-loving families who like card games such as Sushi Go, Fluxx, or Llamagedón will enjoy Dinomals! 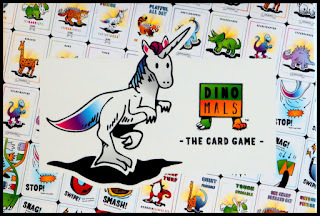 Created by kids, for kids, Dinomals hits all the right notes of funny combinations, adorable animals, set collection, and player interaction with lots of action cards. It will take a prominent spot on our shelf of family games and is already a game that my kids want to share with their friends. 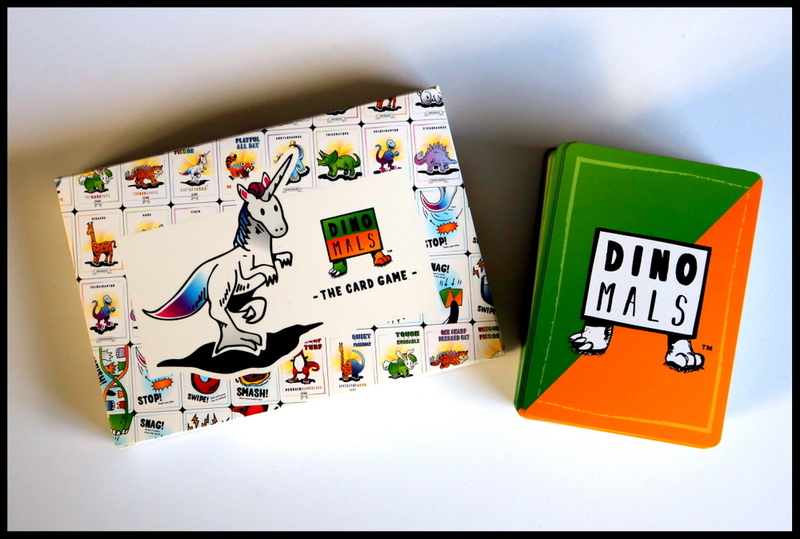 Dinomals funded on KICKSTARTER and is available for pre-sale.